Skookumchuck Narrows has held a reputation as a world-class kayaking destination for some time now, and it was inevitable that river surfers would home in on it as well. 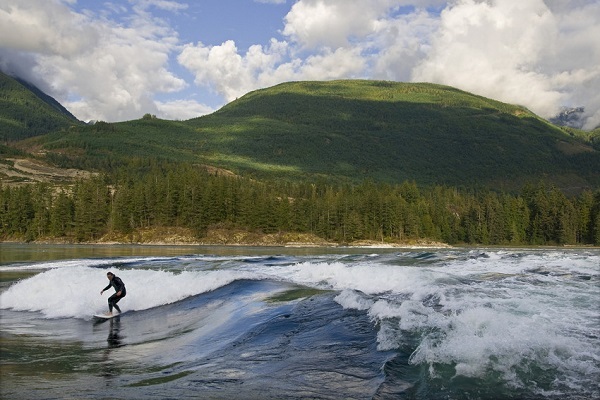 River surfing Skookumchuck – “Big Water,” roughly, in Chinook, lives up to its name. It’s a tidal rapid, so while it’s not exactly “river surfing,” it’s more like river surfing than it is like ocean surfing — the “flow” of the tides creates a true standing wave (or waves, depending on conditions). A huge amount of water flows through the narrows when the tides are high enough and fast enough to bring the wave into condition — it’s effectively a 60,000 cfs “river” that forms a wave that can be overhead in height and up to 30 feet wide. Logistics are both more complicated and less complicated than planning most river trips. More complicated because you need to worry about timing – time your tides wrong and you can be left without much daylight surfing time. And it’s not the easiest place in the world to get to. It’s less complicated because the tides, thanks to the moon, can predicted months, even years, in advance. So you know when the wave is going to be “in” with quite a bit more certainty than you can predict river flows months ahead of time. Depending on flows, you’ll get a 2-4 hour window on each tide. Given the ultra-high volume, you need to pay more attention to safety here than you may at your local surf spot. While those blown off the wave can catch an eddy behind the wave, if you’re blown too far downstream you’re going to be on “the tour” — fighting your way through huge eddylines and whirlpools to get back to safety. Stick with your board, conserve your energy, and don’t panic. In my mind it’s PFD-mandatory territory, and keep an eye on your friends to make sure nobody gets into trouble. Also, assuming this is a road trip for you, be sure to pack for some downtime. There isn’t a ton going on in Egemont, so bring books, entertainment, etc. There is some paid camping in town, as well as a few different lodges or guest house options. The size of the wave depends on the strength and flow of the tide, which is strongest near full moon and the new moon. And fortunately, that’s a predictable thing. Keep an eye on the timing – you’ll want to be there when the tide starts to come in, and also pay attention to the speed of the tide. You’re looking for a speed in the 10-11 knot range or better, though things start to really solid around 13 knots. Flow information is avaliable on the web. Select “Sechelt Rapids” from this list. Or check here; you want the window around the “max flood” time, about two hours before and after. Vancouver is the nearest big city, and if you’re flying that’s probably your starting point. Head west out of town on Highway 1 to Horseshoe Bay. Catch the ferry from Horseshoe Bay to Langdale (show up at least 30 minutes early, it’s often full). Then drive Highway 101 to Egmont Road. Follow this to Egmont, where there is parking at the water’s edge. The wave is still a couple of miles away, up the inlet to your right. You may be able to paddle on a SUP, or carry up a forest trail a few hundred yards back up the road. If you’re coming up from Seattle, cross the border via Highway 543, then take Highway 15 and Highway 1 to the Ferry Terminal to skip Vancouver traffic.